Centigon France is pleased to announce its participation at the 20th edition of MILIPOL Paris 2017, the world's national homeland security fair. During 4 days, French international players from the security and safety sector will gather in Paris to present their latest developments. On the Centigon booth (Hall 6, Stand P093) you will have the opportunity to discover the armoured 4x4 Fortress Intervention. 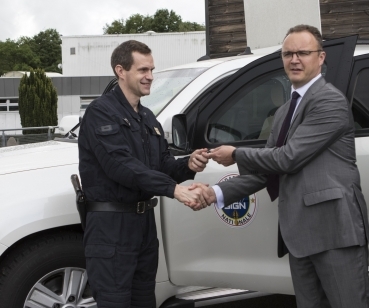 Developed jointly with the GIGN, the vehicle is intended for intervention groups and special forces for their reconnaissance and intervention missions. During the Exhibition, Mr.Baucher, the CEO of Centigon Security Group, and Mr.Feng, the President of Centigon Security Group will arrive and meet participants in group's booth. Come and meet us at Paris-Nord Villepinte Exhibition Center from November 21 till 24.